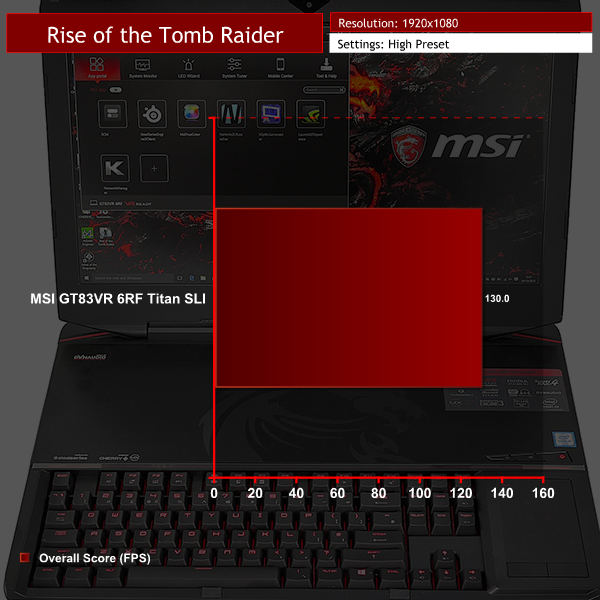 Today we have a MSI GT83VR 6RF Titan SLI which follows the same form as GT80S except that it packs in dual GTX 1080 GPUs. 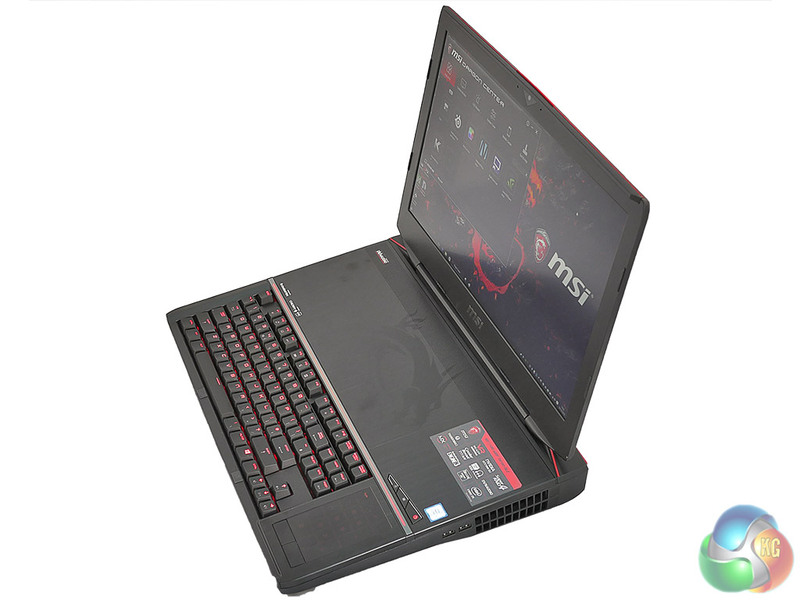 The specific model in our video and photos is the high end 028UK that costs £4,399 and comes with a Core i7-6920HQ CPU, 64GB of DDR4 memory and dual GTX 1080 GPUs in SLI. 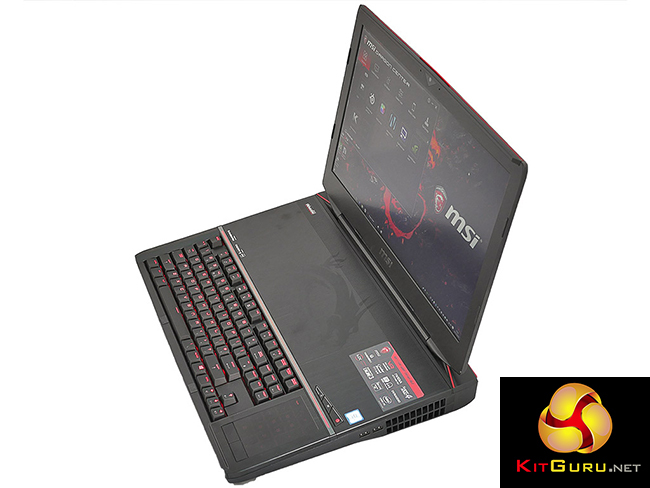 There is a slightly more modest model – 072 – that costs £3,799 with a Core i7-6820HK and 32GB of DDR4, along with those all-important dual GTX 1080s. 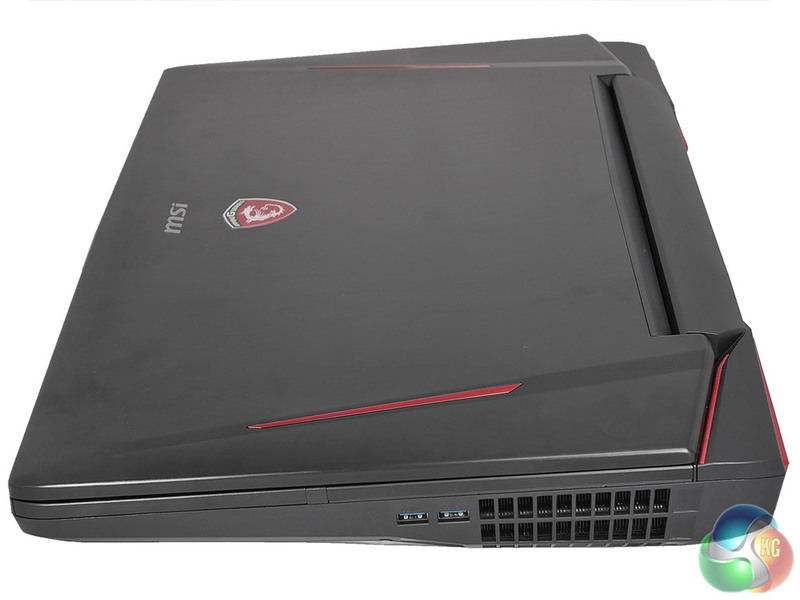 In the bargain basement at a mere £3,099 we have model 6RE with dual GTX 1070s in SLI along with a smaller 256GB SSD. 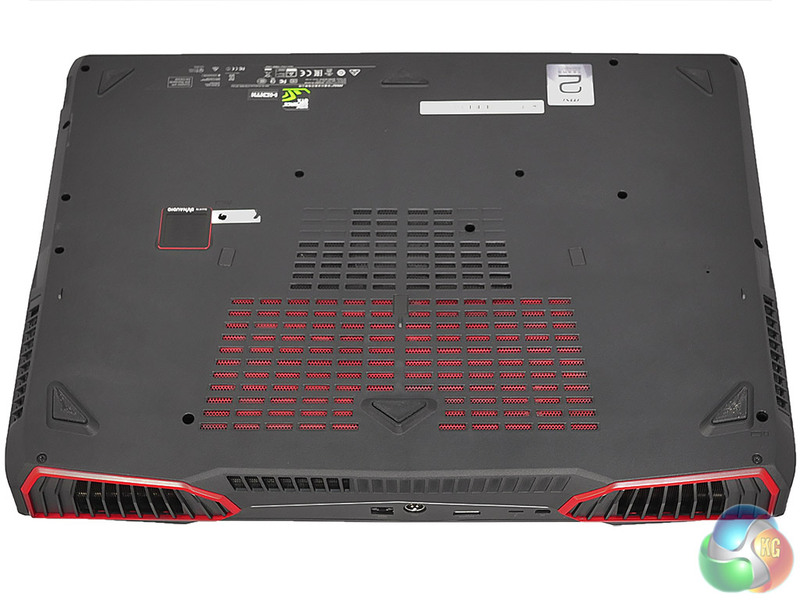 One other major difference between these models is that the GTX 1080 laptops come with dual 330W power supplies while the GTX 1070s ‘only’ require dual 230W power supplies. 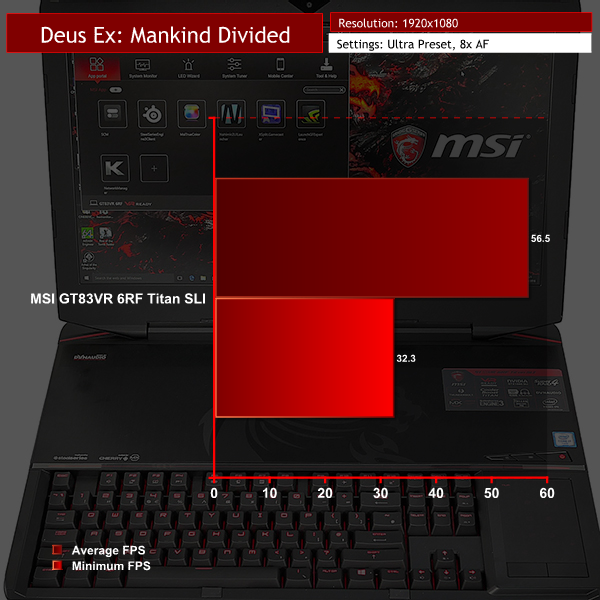 Power is a major consideration with Titan as GTX 1080 works dynamically and will effectively take all the power you can throw in its direction and, provided the cooling works effectively, will work harder and harder. 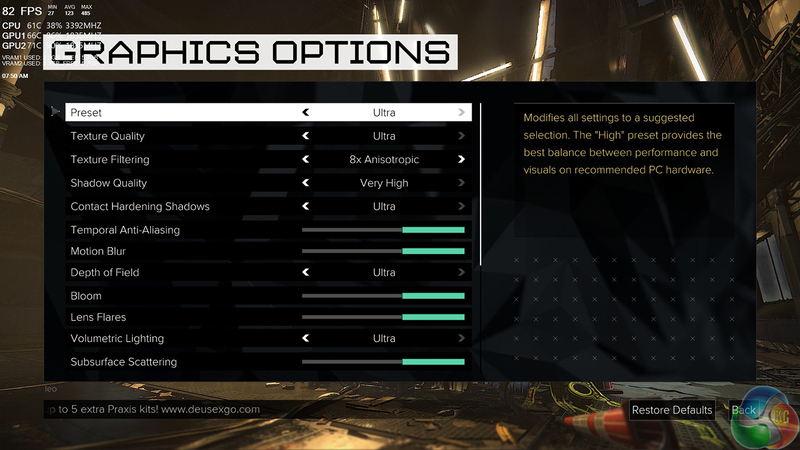 Ed (20/10/2016): You can read our further written analysis, including game testing with a 1440P SuperSampling resolution and 4K monitor, HERE. 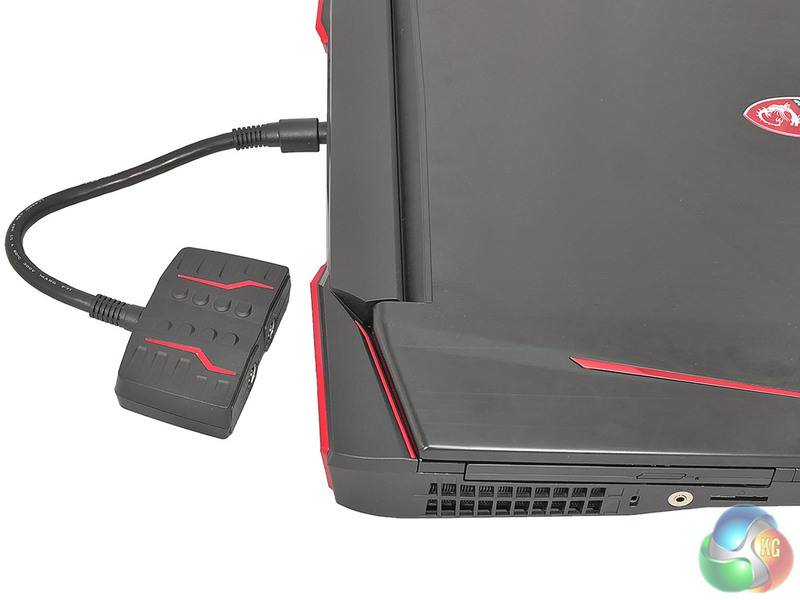 Connecting the new Titan to mains power is a novel experience as the two hefty power bricks are linked together at the output end and then connect to a Y-piece which in turn plugs into the laptop. 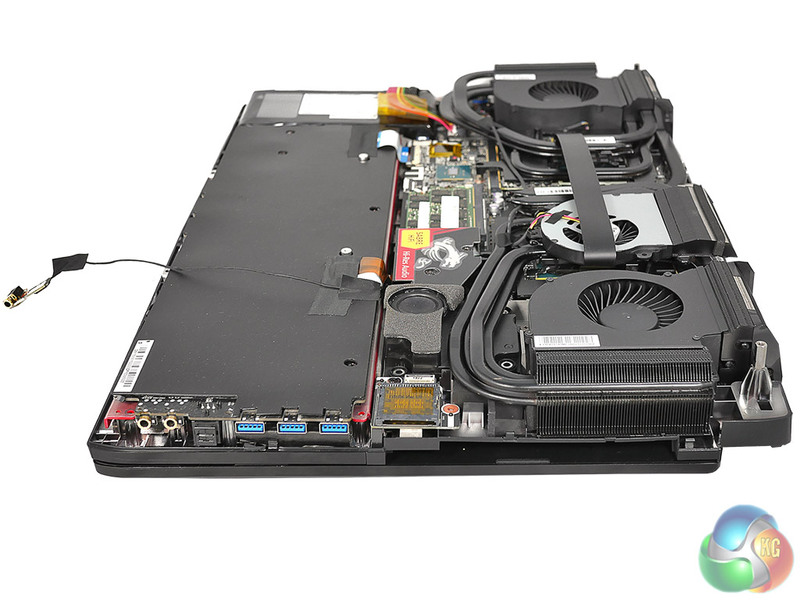 The socket on the end of the cable does not lock into the laptop, so you need to arrange the hardware carefully on the table to ensure the cable doesn’t fall out while you are gaming. 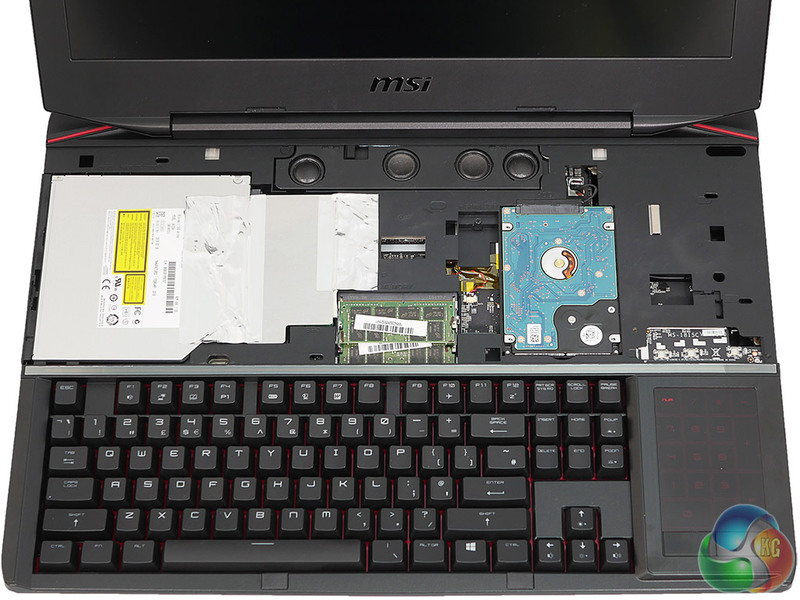 By contrast, turning Titan on is entirely familiar; press the power button, admire the red LEDs in the mechanical keyboard and wait for a massive array of software to fill the system tray. 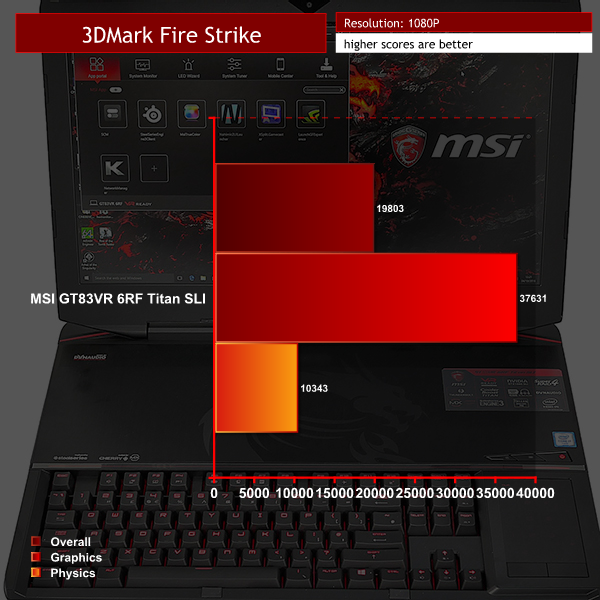 MSI is justifiably proud of its relationship with a number of partners (Intel, Nvidia, SteelSeries, Killer, Nahimic and Xsplit to name but a few) and every last one of them seems to pack in some software. 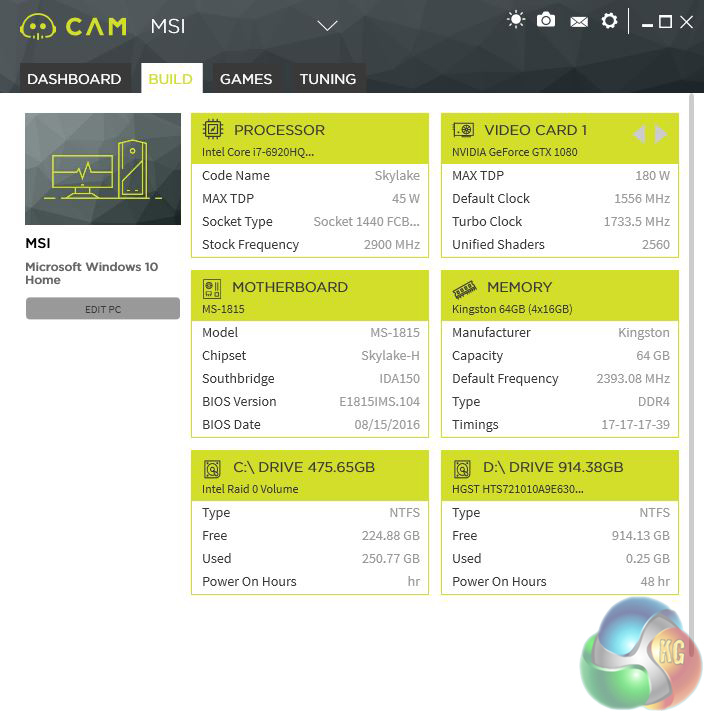 Added to that, you have MSI’s own Dragon Centre utility and we recall uninstalling Norton as the very first task after the laptop arrived. Taking a tour around the outside gives you a long list of high end hardware. 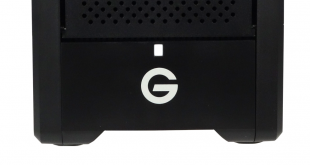 On the left we have a Blu-ray drive, three USB 3.0 ports and your audio connections and on the right hand side there are two more USB 3.0 ports. There is nothing on the front apart from some activity LEDs. Turning to the rear we find a Mini DisplayPort, type C USB 3.1 Thunderbolt, HDMI, Ethernet and the power plug. 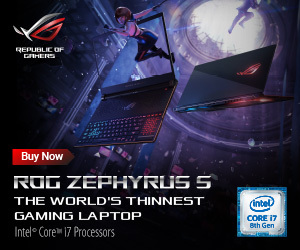 This business of putting USB type C on the rear of a laptop chassis appears to be quite common yet it seems rather odd. If you want to connect your shiny new phone you have to go around the back? On the other hand if you consider USB 3.1 is best suited to hooking up an external display or some sort of storage array then all well and good. 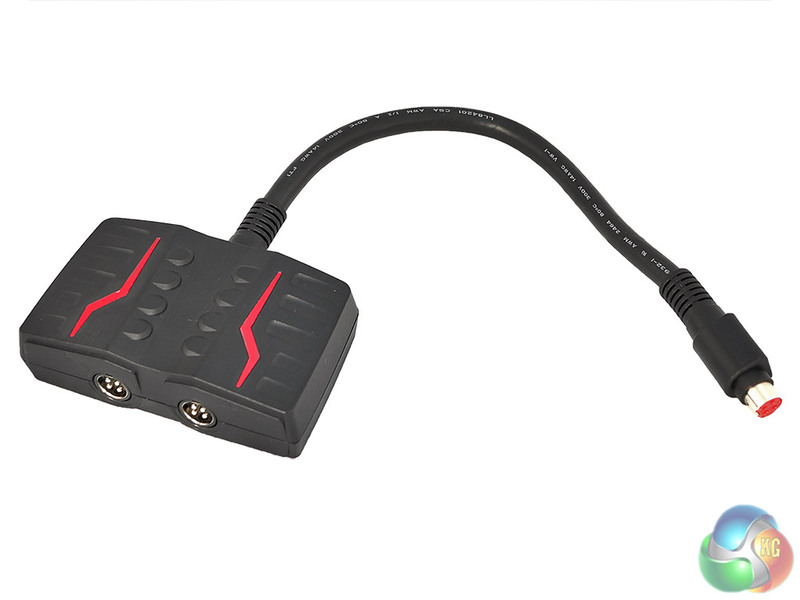 The large number of USB ports is part of the reason why MSI is entirely justified in slapping a VR logo on Titan, as you have plenty of ports for the various peripherals that come with your Oculus Rift or HTC Vive. 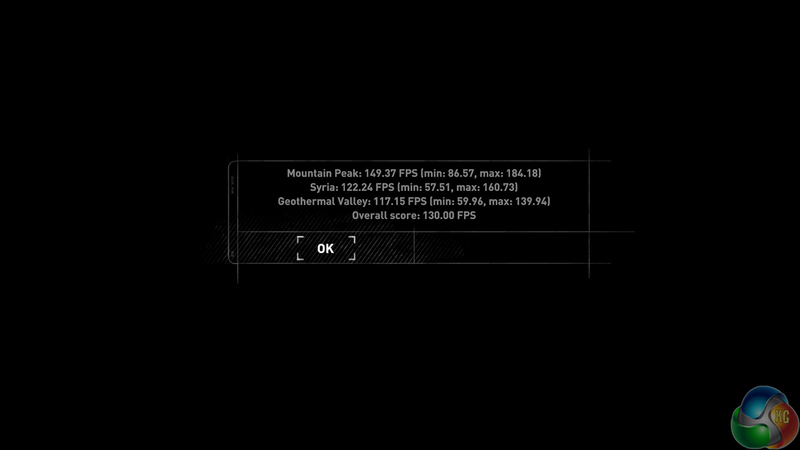 The other reason, of course, is that dual GTX 1080s can power games faster than 60fps. Job done. 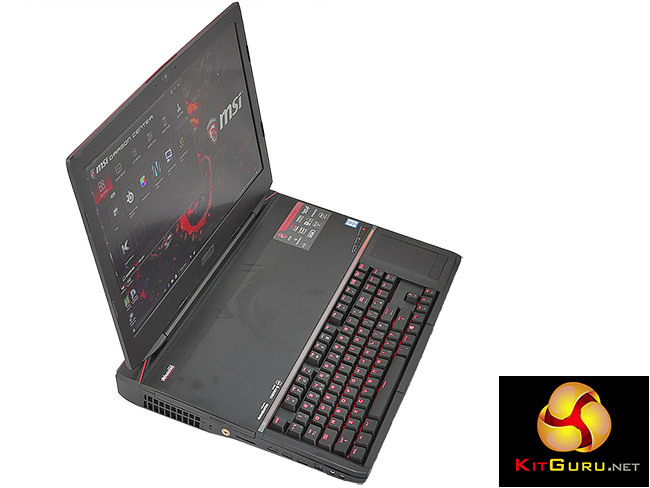 Those graphics outputs are more significant than they sound as Titan comes with a huge 18.4-inch IPS display that looks lovely but lacks any bells and whistles. 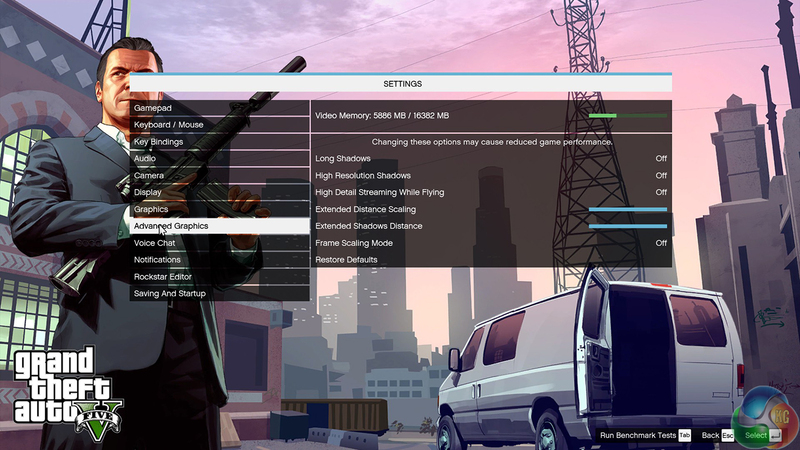 It is only 1,920×1,080 with 60Hz refresh rate and it does not support G-Sync. You can easily argue that G-Sync is unnecessary as the enormous graphics power means you will never have to worry about low frame rates or tearing but let’s face it, on paper Full HD at 60Hz sounds a bit limp. 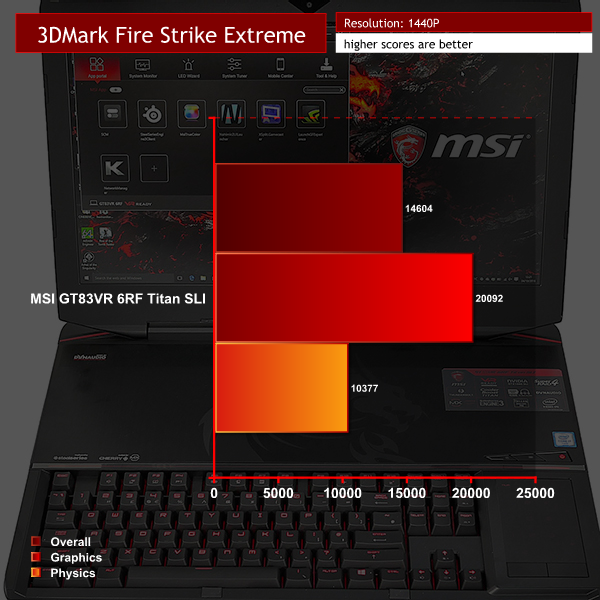 MSI’s position is that the display is a fall back and any sensible gamer will hook the Titan up to their 4K TV or a large, high-resolution display. We can understand that line of thinking but are not entirely convinced. 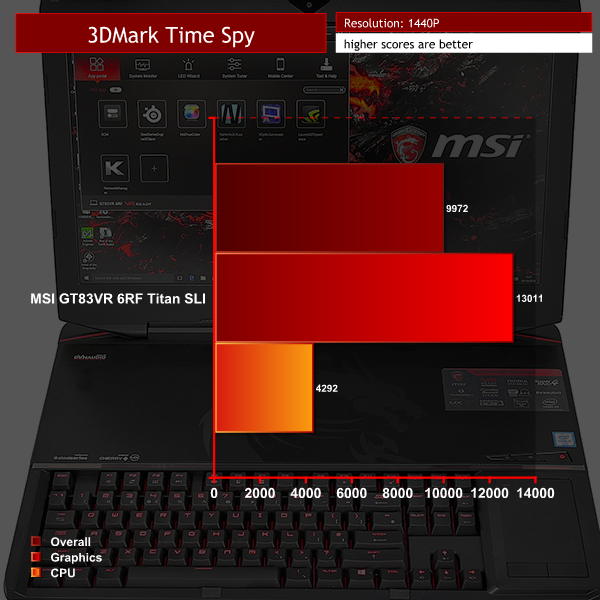 While we appreciate that options for 18.4-inch displays are thin on the ground we would like to have seen MSI do more. You may be wondering why Titan is so large and a quick look at our photos and video will show you there are two halves to the answer. 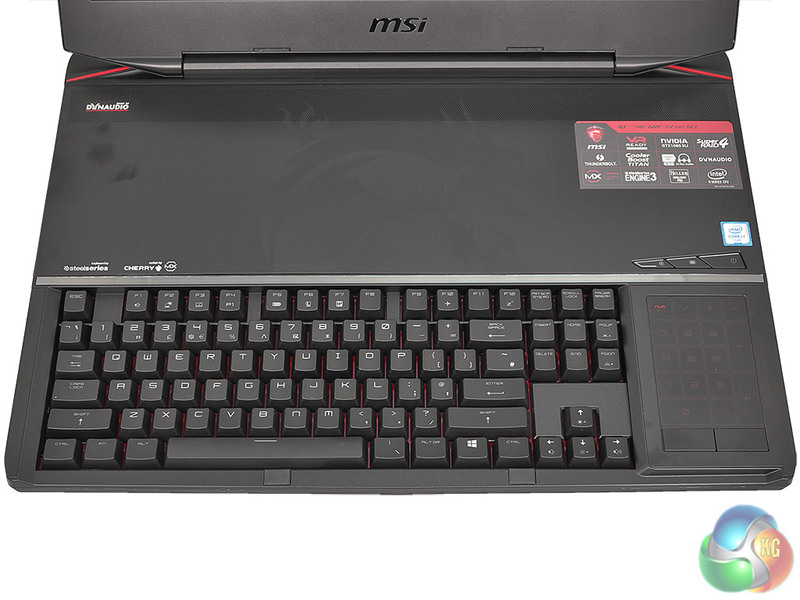 The first part is that the mechanical keyboard with its Cherry switches takes up a significant part of the chassis. The second thing is how much space is required by the cooling system. 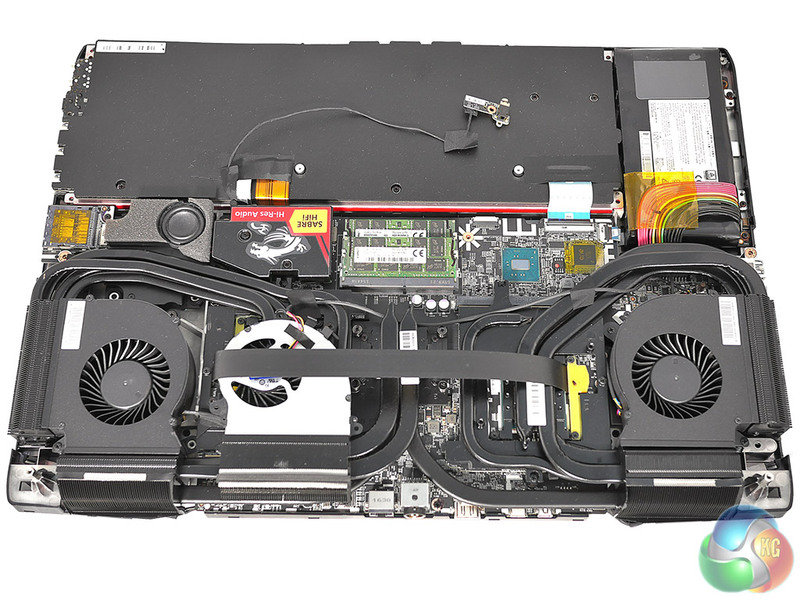 It looks slightly more extensive than the GT80S cooling system as MSI has added a small helper fan near the CPU, but most of the cooling is handled by two enormous turbines in the rear corners of the chassis. These draw air from the centre and expel it to the side and rear through those enormous vents. How much heat are we talking about? When Titan is idling on the desktop it draws 100W at the mains sockets which rises to 340W in 3D Mark and 500W in Furmark. 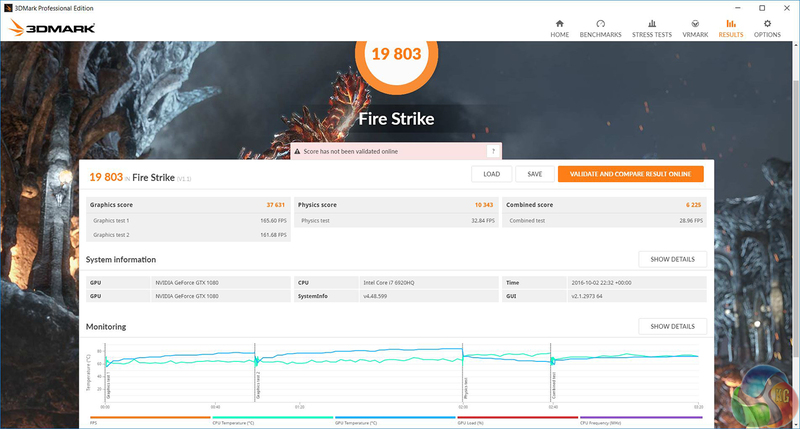 Those GTX 1080 GPUs use plenty of power and produce a huge amount of heat. 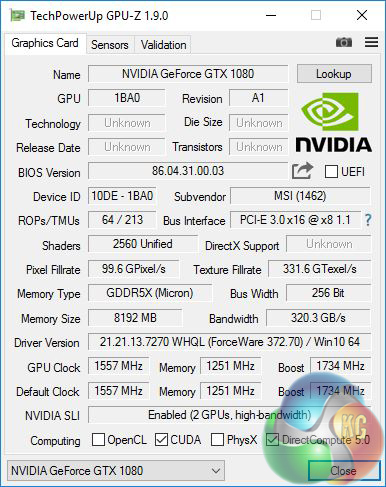 The clock figures for the GTX 1080s are a base speed 1557MHz, boost 1734MHz and memory 1251MHz. 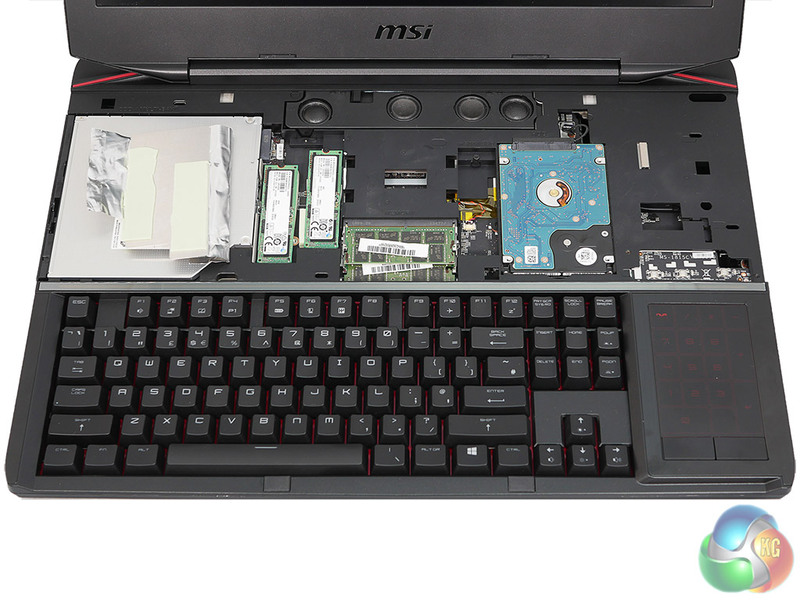 Above the keyboard there is an access panel that allows you to get to the memory, SSDs and hard drive. You only need to remove the bottom panel if you want to perform surgery on your Titan which really shouldn’t be necessary. 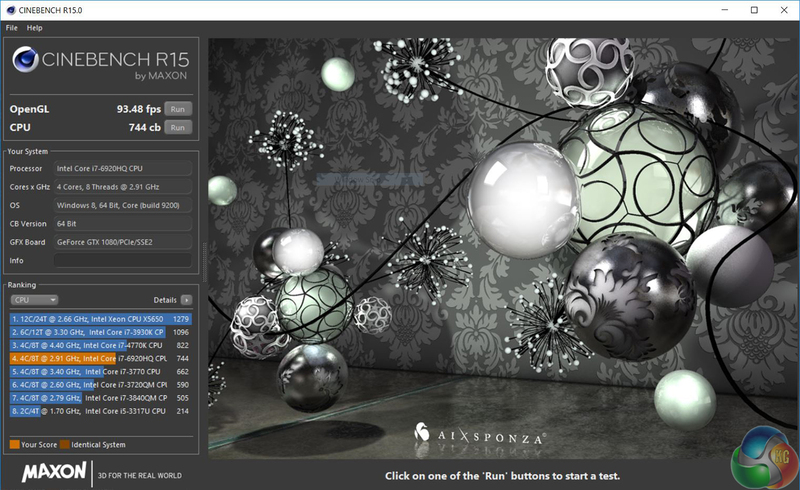 The Cinebench score of 744 is respectable for the Titan’s Core i7 6920HQ processor. 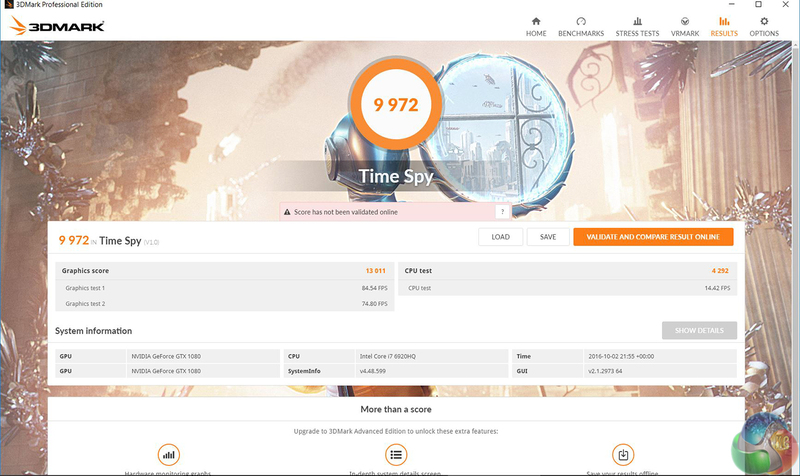 But it isn’t as fast as the 800+ points put up by the overclocked 6820HK in the Asus GX800. We tested the new Titan using the Full HD screen, rather than an external display and it was excellent. 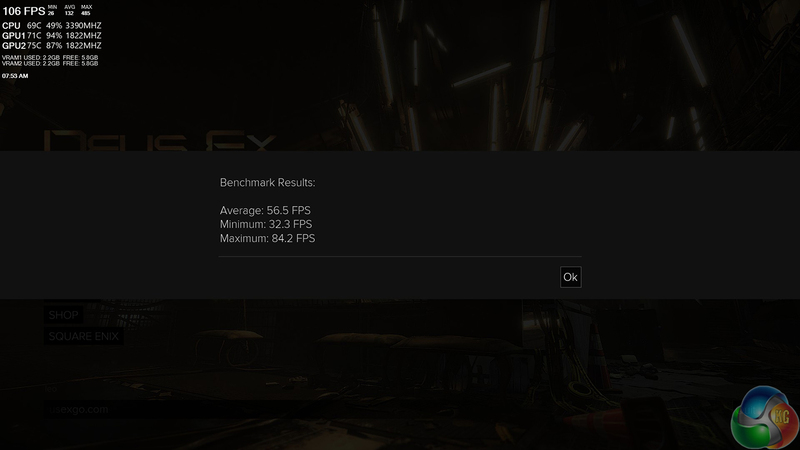 If you want to know how dual GTX 1080s perform at 4K we have figures from our review of the water cooled Asus GX800VH review. 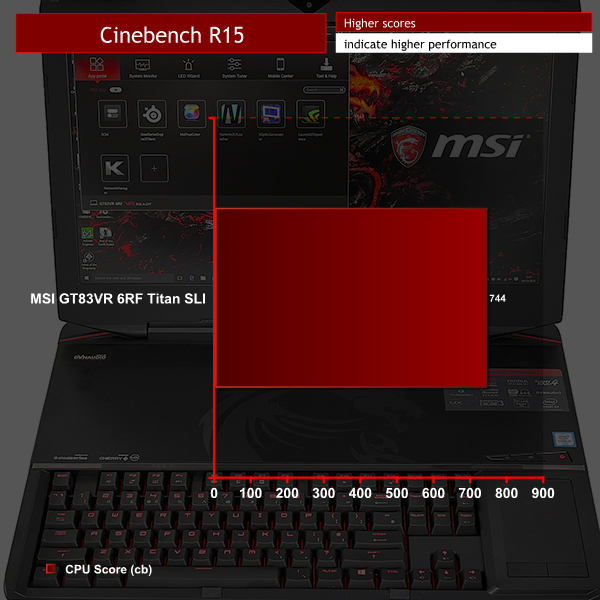 In essence, Titan GT83VR 6RF and GX800VH have performance that is identical. 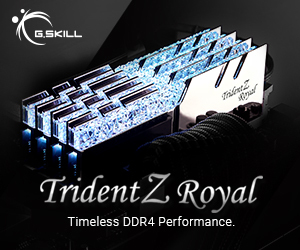 This means you can load your game, crank up the settings and play it without a moment’s thought as Titan simply delivers stunning performance. 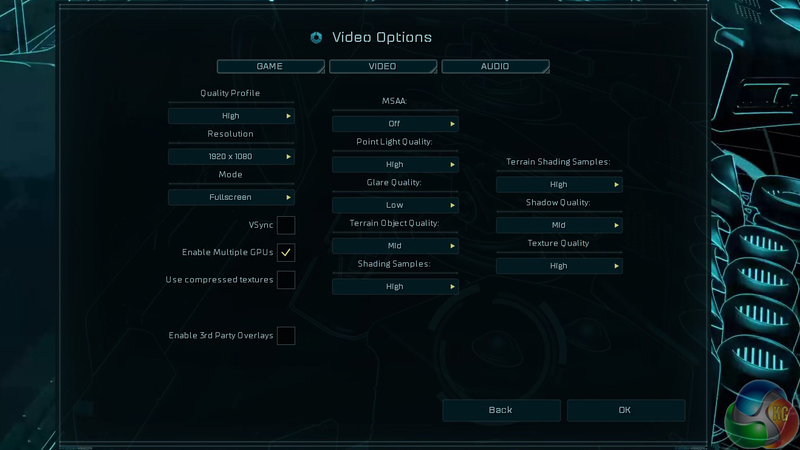 In addition to superb image quality and a sublime frame rate, it was also noticeable that Titan is amazingly responsive. 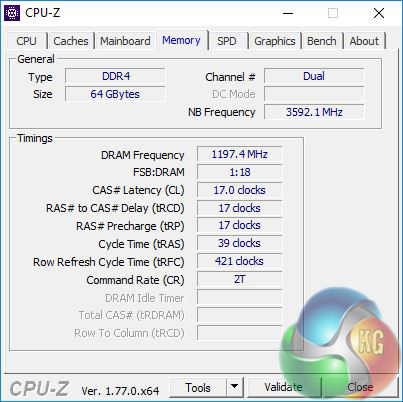 The combination of Samsung SM951 SSDs in RAID 0, a colossal amount of RAM, fast Wi-Fi and a mechanical keyboard is quite startling and means the only thing standing between you and your game is a slow log-on or unresponsive website. In many respects Titan GT83VR provided us with a gaming experience that was as good as anything we have previously enjoyed. 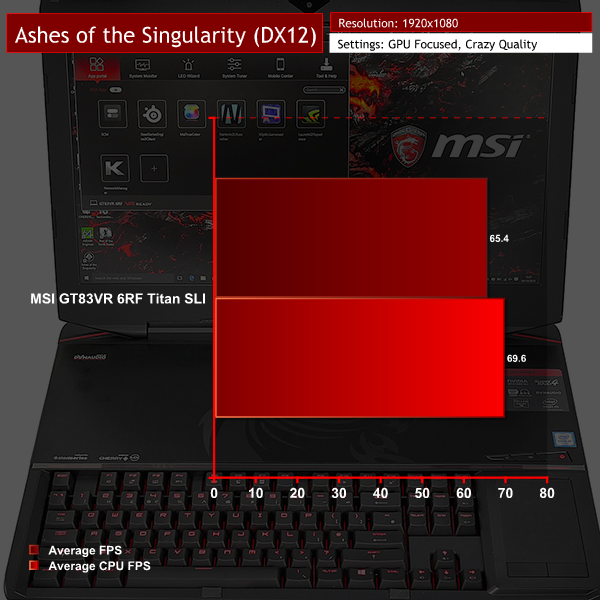 Editorial note: We spent extra time examining the performance of GTA V and Ashes of the Singularity (High preset), as we noticed that the frame rates delivered by the dual GTX 1080-powered GT83VR 6RF Titan SLI were very similar to a single GTX 1070-powered MSI laptop, and also the dual GTX 1080-powered Asus GX800VH with its 4K resolution. The results were consistent and correct. There seems to be a CPU-induced bottleneck occurring at around 85fps with our chosen test settings in GTA V. The GPUs should be capable of pushing past 85-or-so frames per second, but the stock-clocked Core i7-6920HQ looks to be constricting the GPUs’ performance. The situation is the same with Ashes of the Singularity at its High preset. 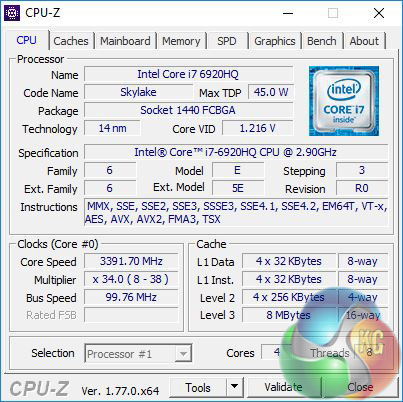 CPU cycles stolen by the somewhat bloated suite of software that MSI runs in the background do not help the situation, either. 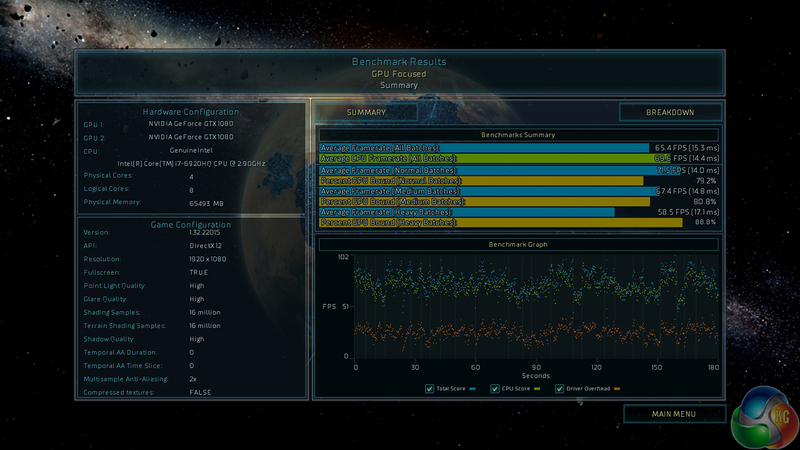 Dragon Center alone can easily show well over 10% CPU usage while the rest of the system is completely idle. Battery life for the Titan is a little over 1 hour according to the PCMark 8 test. That should translate into about 2 hours of usable battery life for real-world tasks. At idle, the laptop draws around 100W from the wall. 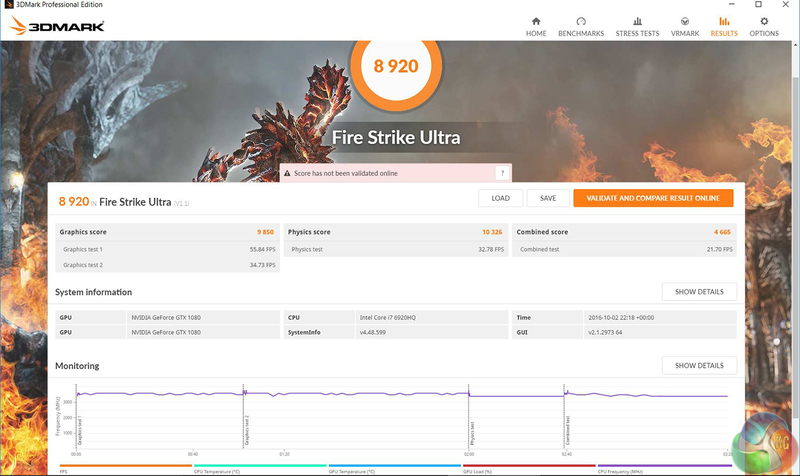 That figure quickly rises to around 500W when the GPUs are loaded and around 550W when the CPU and GPUs are working hard. The downside to the epic graphics performance and huge power draw is that Titan has to work hard to keep the GPUs sufficiently cool. 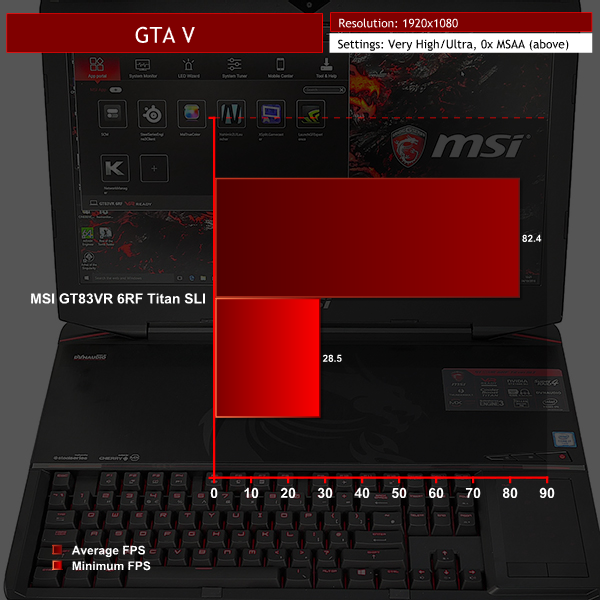 The previous GT80S Titan with GTX 980s ran the GPUs around 70 degrees. 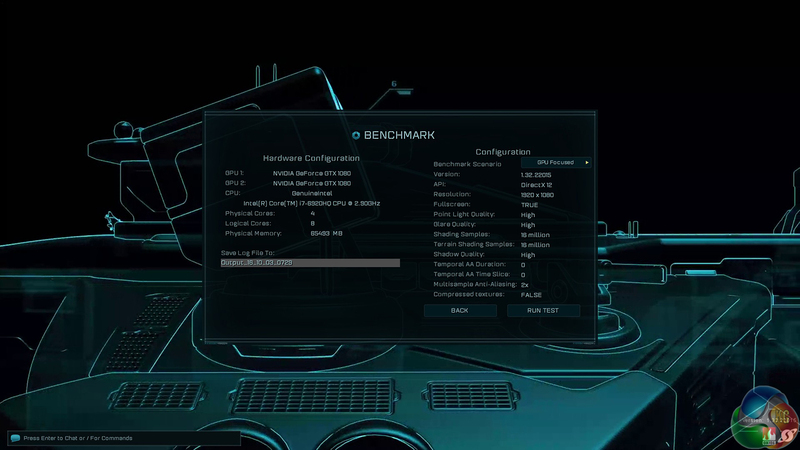 In the case of Titan GT83VR the GPUs sat at 86 and 90 degrees. 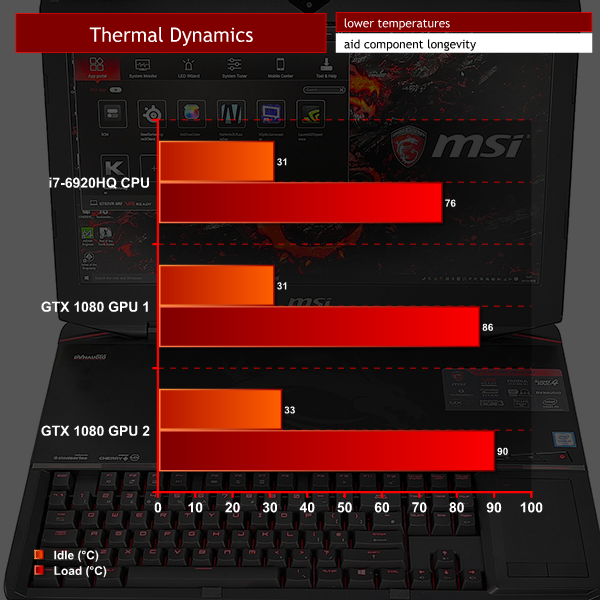 Many KitGuru readers hated the liquid cooled Asus GX800VH (it’s OK, we can understand why) but in that laptop the GPUs ran at 59 and 64 degrees which is nearly 30 degrees cooler. 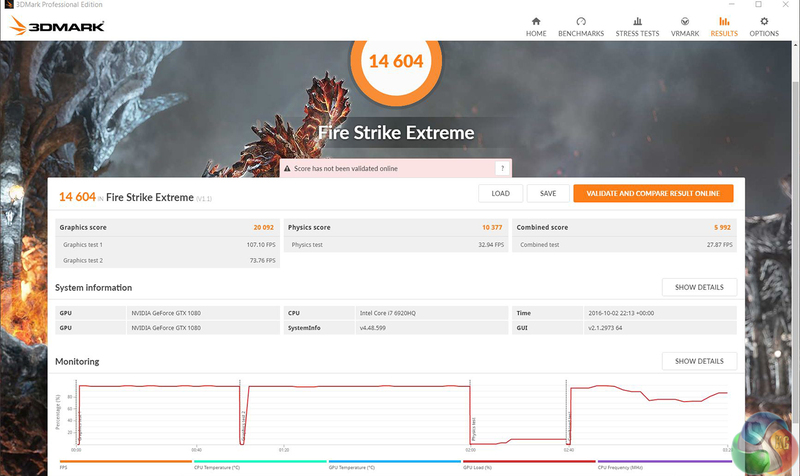 The extensive cooling system inside Titan does a good job of keeping the GPUs under control but there is a price to pay. And that price is noise. Damn this thing is noisy. 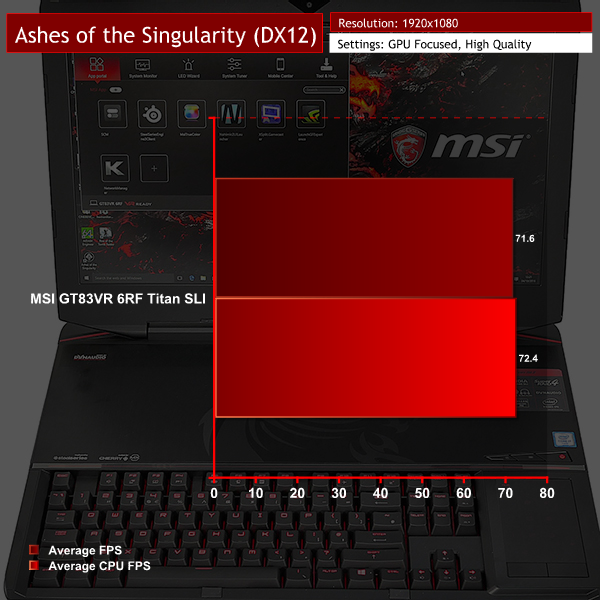 At idle on the desktop, Titan GT83VR surges and constantly reminds you it is alive. Under load the fans move from audible to louder to downright intrusive. 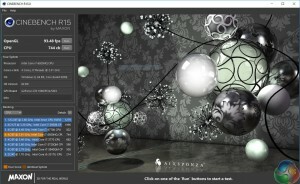 It is clear the fans work as hard as necessary to keep the GPUs below 90 degrees, so the cooling is dynamic. 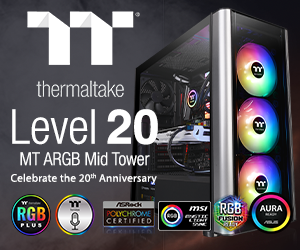 Clicking the manual fan button kicks the fans up to a monstrous speed that is outrageously loud, but in the real world the fans never reach anything approaching full speed. The problem with the fan noise is that you cannot play games with anyone else in the same room unless everyone is either wearing headphones or is deaf. 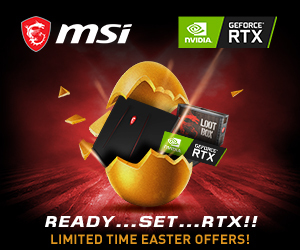 The problem with that scenario is that if you connect Titan to your TV you will clear the rest of your family from the living room. Ideally you need a quality 4K TV in a dedicated gaming room. 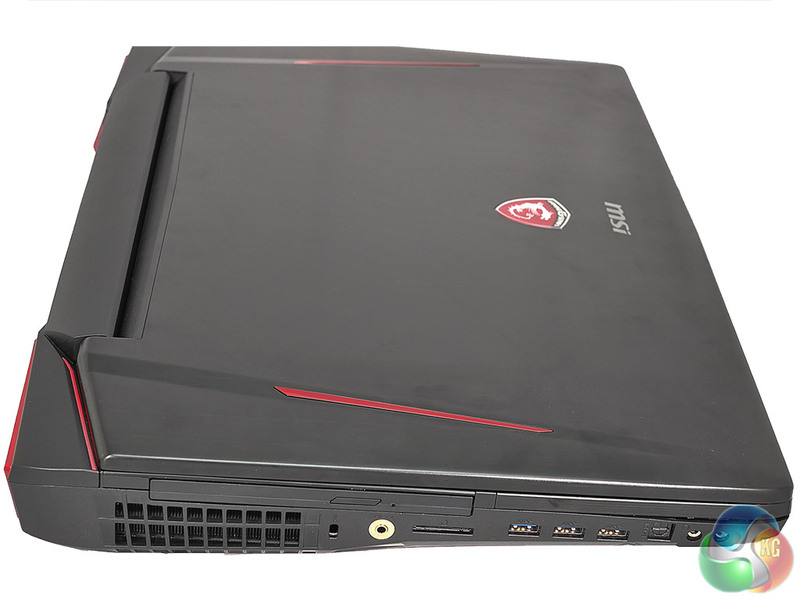 The latest MSI Titan SLI is deeply impressive. 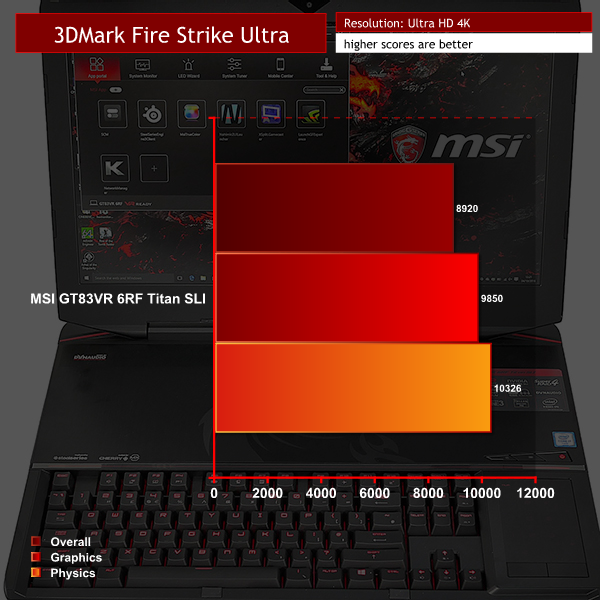 However, it is clear the dual GTX 1080 GPUs have pushed the air cooling system to its limits. While the coolers have little trouble keeping the hardware below 90 degrees they can only do this by spinning the turbines at quite a rate and the consequence is noise. Lots of noise. 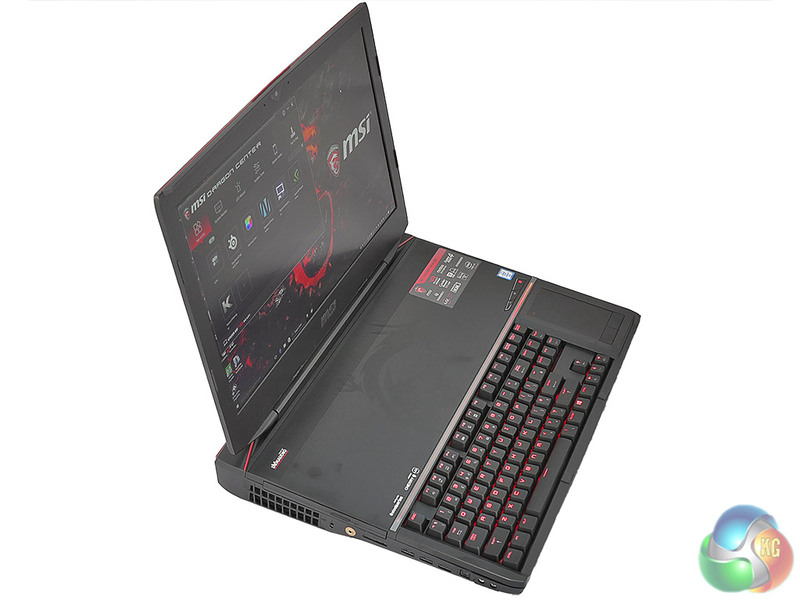 As a portable solution, the Titan makes better sense than Asus GX800VH. 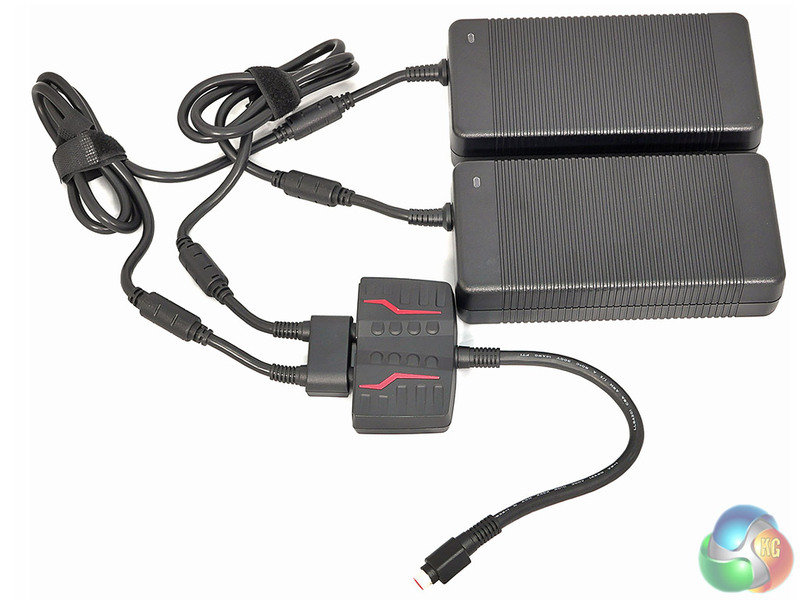 But even so, it is big and heavy and you need to lug two large power bricks wherever you go. As a gaming experience we were blown away by Titan but are still left feeling the screen should have a higher refresh rate and perhaps a higher resolution too. Curiously, perhaps, we are not troubled by the price. £4,400 is a huge sum of money but we can see exactly where it has been spent. 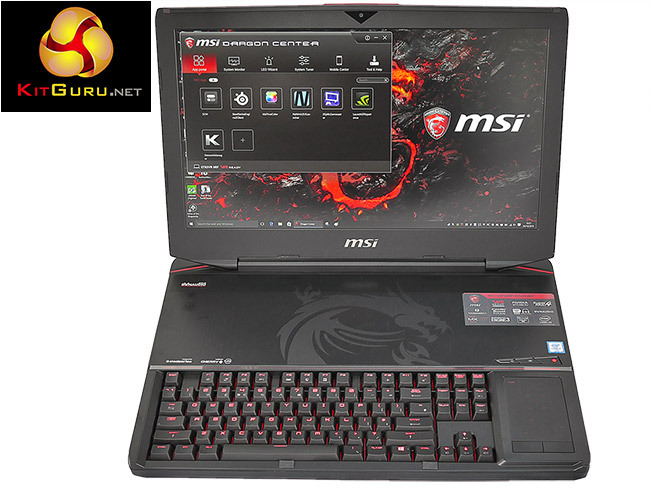 This is a phenomenal laptop but blimey, it makes a lot of noise when it is working hard. 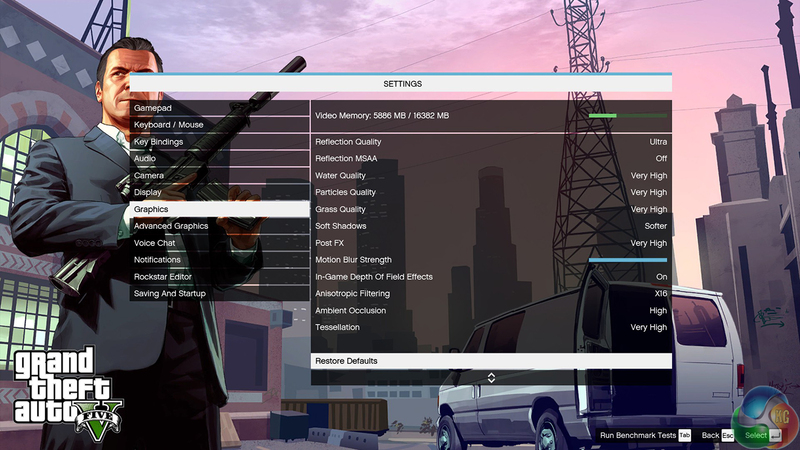 You can read our further written analysis, including game testing with a 1440P SuperSampling resolution and 4K monitor, HERE. 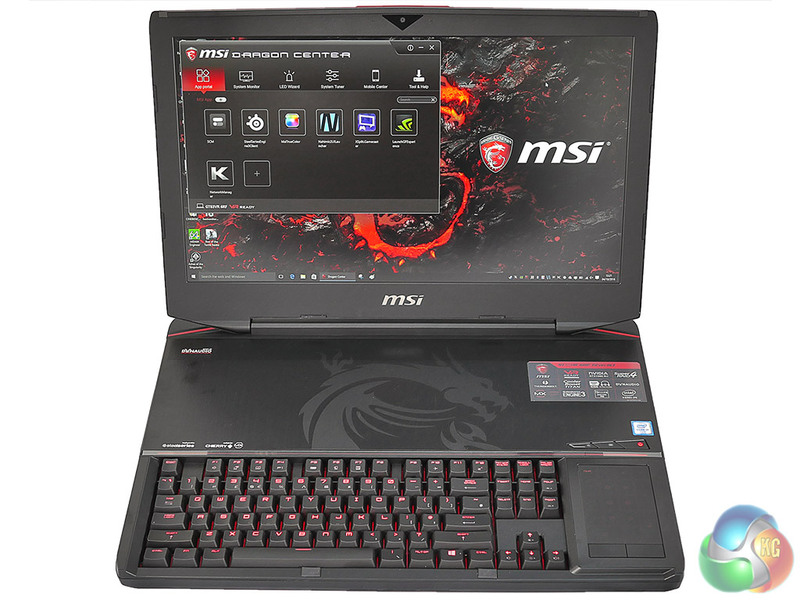 The MSI GT83VR 6RF (028UK) Titan SLI gaming laptop is available from Overclockers UK for £4,499.99 (inc. VAT). 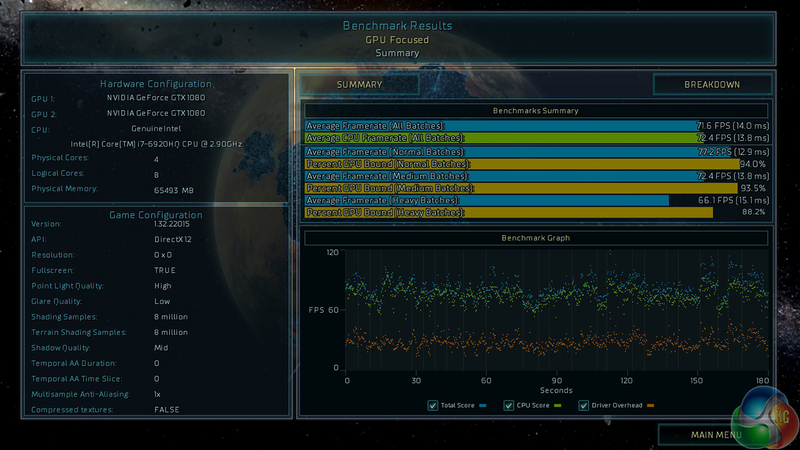 Dual GTX 1080s are epic. Samsung SM951 RAID is instantly responsive. Keyboard with Cherry MX Brown switches feels great. 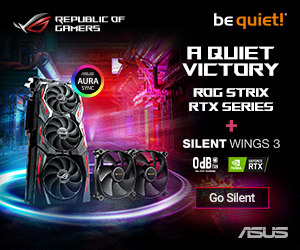 High noise levels from cooling fans. 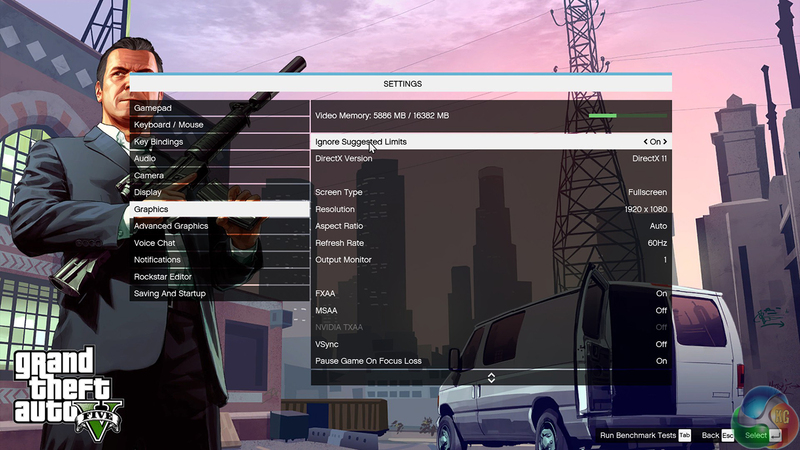 Screen is only 1,920×1,080 at 60Hz. Fixed red lighting in the keyboard, no RGB. Comes with a good deal of software bloat. 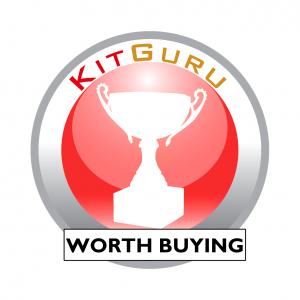 KitGuru says: High power draw, plenty of heat, lots of noise and massive performance.